Yukari Hayasaka considered herself a perfectly normal 18-year-old senior at Seiei Private Academy. To be honest with you, she was hoping to get through life in one piece. Whatever plans she had were thrown for a loop when she was all but shanghaied by itinerant fashion designers. Now things are getting really bizarre. 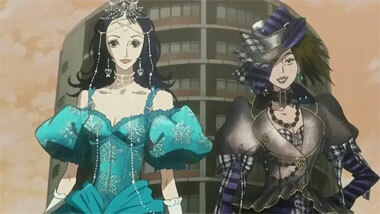 A bunch of students from the Yazawa School of Design have formed a company of their own called Paradise Kiss. They took one look at Yukari, and didn't see a schoolgirl. They saw the perfect model for their clothing line. And it doesn't look like theyíll take "no" for answer. They're a motley bunch these Paradise Kiss guys. Arashi Nagase is a loud mouth punk with the social graces of the Bay of Pigs invasion. Joji Koizumi (a.k.a. George) is a dapper rake who can seduce anyone regardless of race, color, creed or even gender. Miwako Sakurada doesn't seem like she left second grade. And Isabella... Well... You'll find out about Isabella. Will Yukari find happiness as a supermodel named Caroline? How is this going to affect her grades? Once she acquires a taste of the fashion life, will she even care about her grades anymore? Didn't she have a boyfriend before this whole thing happened? 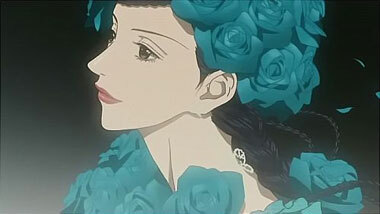 Paradise Kiss is based on a popular girls manga by internationally acclaimed artist Ai Yazawa. It sports some excellent fashion designs by 'A/T' (Atsuro Tayama). It's a very cool concept to have a real fashion designer creating for an anime. It also features a closing theme song by Franz Ferdinand (a pop group that has been featured in quite a few weirdly animated videos of their own). 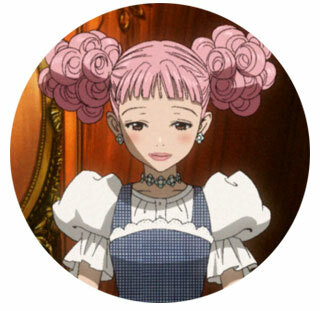 Get trendy with Paradise Kiss. You'll never wear sweat pants again. 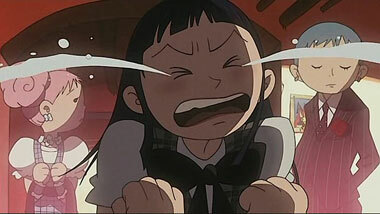 Below: Scenes from Paradise Kiss.